For over 100 years, the Alumnae and Alumni of Goucher College (AAGC) has been an integral part of the college, serving as a voice for alumnae and alumni, witnessing and influencing Goucher’s history. 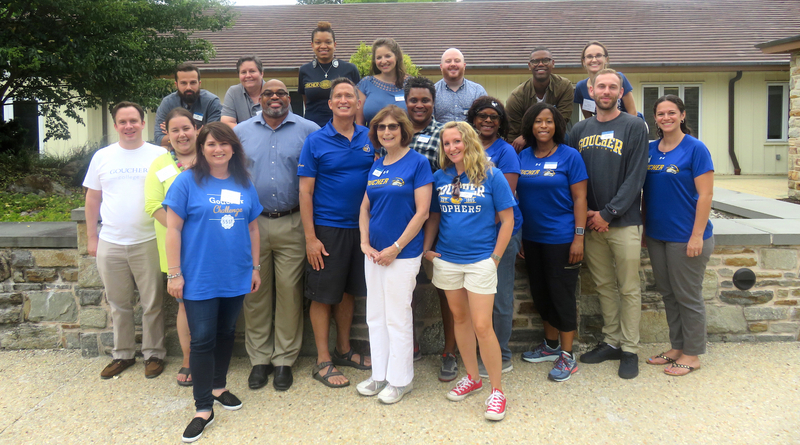 From the decision to move the campus to Towson, to the development of countless strategic plans, to the hiring of many of our college presidents and top administrators, including our current leader, President José Bowen, the AAGC has strong roots in Goucher’s history and will continue to serve alumnae/i into the future. New President (and former Vice President) Kara Bundy ’02, the deputy director of CASA (Court Appointed Special Advocates) in Prince George’s County, says she hopes the board will play an active role in campus life. New Vice President Jay Gilman ’09, the associate director of Minnesota Fringe in Minneapolis, echoed Bundy’s focus on helping students with networking and jobs. In addition to career development, the AAGC is making moves to support recruitment and admissions of new students. Kimberley Gordy ’06, who works as the director of college counseling at St. Timothy’s School in Stevenson, Maryland, will fill a new admissions liaison position on the board, where she will focus on working with admissions staff to expand the base of applicants to the college. Gordy said she took a lot away from her own experience at Goucher, but it’s a recent innovation she’s been focused on. Relationship-building will also be a key for board member Carol Hirschfeld Roth ’70, a retired teacher and administrator in the School District of Philadelphia. Roth steps into another newly created role this year as annual giving liaison for the board, working with the college’s Advancement Office to secure the college’s future. Interested in serving as an alumnae/i volunteer or on the AAGC? Contact Jen Pawlo-Johnstone at jennifer.pawlojohnstone@goucher.edu or 410-337-6181.